Blaptica dubia are a South American species of roach from Guyana. One of their common names is the Orange-spotted roach, although most people simply refer to them as "dubia". They are from tropical areas and do well in high heat like you would imagine in a rainforest. 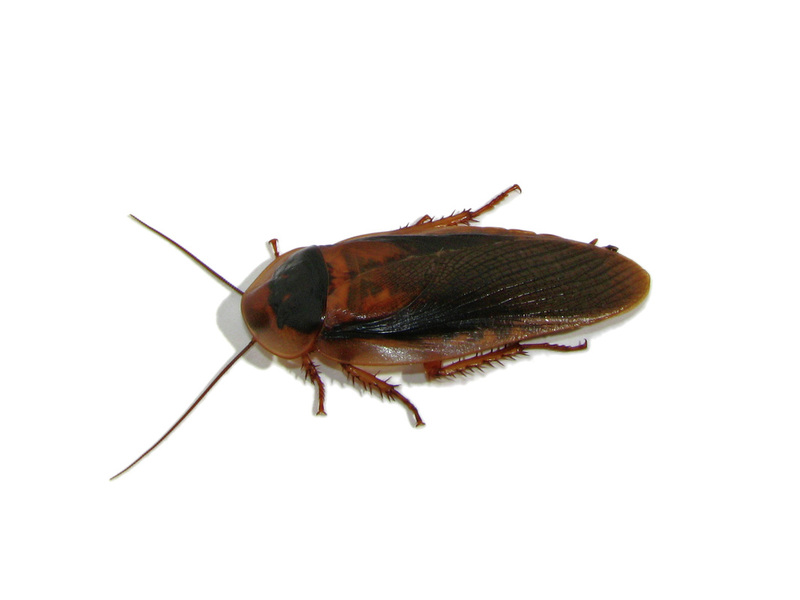 These are a moderately sized roach species that tops out at about 1.75 to 2.0 inches (5cm) in length. They don't get really large like a Madagascar hissing cockroach, and aren't small like a Blatta lateralis or the normal American cockroaches that a lot of people see in their homes. They can move quickly at times, but for the most part these roaches are slow and can be recaptured quite easily. Their large bodies and shorter legs don't give them the ability to move very fast for more than short bursts at a time. They do have small spines on their legs that can be startling at first, but they don't "hurt" per se. 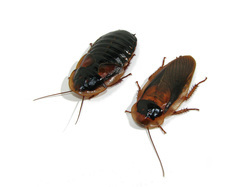 The photo above is of a pair of dubia roaches. The female is up and to the left and the male down and to the right. Females will have the large dark thicker body, and males will have the large wings. The nymphs will look just like the female except that they will be a drab brown color. The freshly born nymphs will just look like little pillbugs, like the ones you would find under a rock or something in your yard. They make an excellent choice for reptile feeders since they are quite easy to care for. They can't climb smooth surfaces (glass, plastic, etc), can't fly, are relatively odorless, require pretty high heat to even survive, and produce live young without laying typical egg cases. The enclosure for a colony of dubia roaches can be very very simple. Most people will use a large Rubbermaid or Sterilite tub with drill holes or a screen hot-glued into the lid. There should be some type of ventilation like this to allow heat to escape and provide adequate air flow. The tub can be either clear or opaque...it doesn't seem to matter. If you have a large colony, a garbage can might be a good option as an enclosure also. No substrate is necessary for these roaches, although some people allow the frass (roach poo) to build up and create a bottom layer, which they feel is good for the roaches to have since it is thought that young roaches feed off the poo of the adults. Peat moss or something can be used at well, but I find that this just creates an unnecessary mess that I would have to deal with later. The only structure needed within the enclosure is stacks of egg crate material to allow the roaches to climb around and hide. This is the most typical thing that roach keepers and breeders will use. Since the roaches need such high heat, find a heat mat of some type that will raise the temperature of the bin to about 102-104 degrees Fahrenheit. It seems hot, but our own body temperature is 98.6, so it's not much warmer than us. A dog bed heat pad or even a therapeutic heating pad (for sore shoulders, neck, etc) can be used to bump up the temperature. There are a countless items that dubia roaches will consume. The best foods seem to be those that contain high moisture content, such as fruits and vegetables. They will readily eat apples, pears, lettuce, celery, potatoes, carrots, brocolli, etc. The one thing that I shy away from is any spinach, since at one point I fed spinach to my colony and they seemed to crash...it may not have been the spinach at all, but I'm taking the precaution of not doing it again. Any type of moist insect gutload that you can order online or buy in a petstore is also good for them. A constant food source other than the moist foods should be provided as well. Most people use some type of high protein dry dog or cat food. It can either be crushed, left in whole kernels, or even slightly moistened with misted water. Catfish or Koi pellets and chicken feed also work very well. Fish food flakes are also loved by these roaches. They other thing you want to make sure they have is some type of water source. This normally comes from their diet, so if you are feeding lots of moist fruits and veggies, then you probably don't have to worry about added moisture. If the main diet is a lot of dry foods, then you might want to use water crystals. You can find them on many online reptile websites, and they work out very well. They are perfect in that they don't allow roaches to drown in the water dish, since they are rigid enough for the roaches to basically "eat" the water. Breeding these roaches is very simple...you just have to have a male and female together and they will produce young. A female will give live birth once the nymphs are mature enough inside of her, and once outside fo the female's body, she will protect them by standing over they little ones. They will come out completely white with very soft exoskeletons. It takes them a few hours before their shells with harden up slightly, at which point the female allows them to fend for the themselves. The nymphs normally mature inside of 6 months. The dubia roaches top age is around 2 years old, but that gives them plenty of time to go through multiple breeding cycles. Continue to keep them warm, well fed and hydrated, and they will provide you with a good food source for any reptile you may keep.